"Mark Twain's American classic is performed by veteran actor Michael Beattie, whose 1840s dialect and Southern accent is infallible. Tom, Huck Finn, Aunt Polly, Injun Joe, and all the other characters are perfectly voiced, with each receiving a distinct identity. The narration draws listeners into the magic of the tale, accurately portraying the social values, superstitions, and humor of Tom's childhood along the Mississippi River. An excellent choice for school and public libraries for group, individual, or family listening." "... a fresh performance by Michael Beattie........Beattie highlights the wit and wisdom that lie behind the adventures of the mischief-maker Tom Sawyer (and) particularly excels in two of the most well-known parts of the story: when Tom tricks his friends into whitewashing a fence and when he runs away from home and is believed dead...makes Tom and Huck Finn into opposites, with Tom talking fast and Huck speaking with a drawl ........ an excellent introduction to the great American author." "...Beattie's got a flair for the material that grabs you from the first sentence and doesn't let go 'til the last one. If you haven't listened to him yet, do yourself a favor and grab a copy, you'll be glad you did!" The Adventures of Tom Sawyer is not only a classic of American Literature, it's also an abiding favorite. Why? Well initially, because its so much FUN! Which is the first reason you should buy my audiobook. Comedic performance is what I do best and Mr Twain provides plenty of great material to "riff" on. But this is not Animal House humor. It is gentle, whimsical and insightful. That's the humor. The adventure is heart pounding excitement! Secondly, it's educational (now, don't be "skerd" -remember its FUN first!). A unique and vivid experience of mid 19th century American culture is gained while you listen. Thirdly, its a great treat for the whole family. 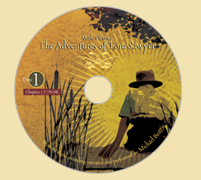 On those long road trips -or daily shorter commutes (the novel is ideal for listening to in short segments)-The Adventures of Tom Sawyer, Narrated and Performed by Michael Beattie-can be a shared family experience that will spur thought, reflection and great conversations. This new, unabridged recording doesn't "politically correct" the story. It is recorded as written by the author -with all the warmth, humor ...and innate racism of the period intact. Need a break from talk radio? Top-40 just a little too insipid? Turn on The Adventures of Tom Sawyer, Narrated and Performed by Michael Beattie, instead. 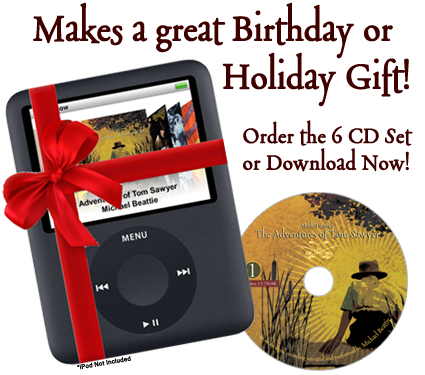 Available instantly as a high quality audio download or as a beautifully packaged 6 CD set. Order now! After your transaction has been processed you will receive your CD set via Priority Mail.